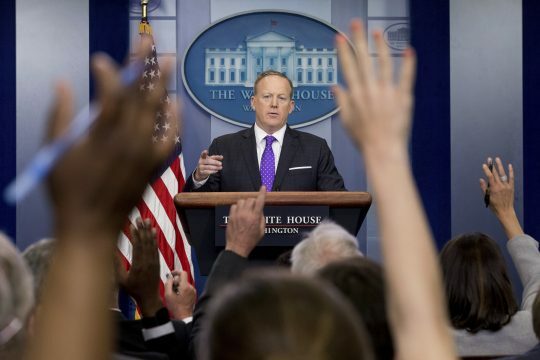 Only three Republicans are represented in Politico Magazine‘s poll of the White House press corps asking their thoughts about covering President Trump's administration. According to the fourth annual poll, 63 press corps members were surveyed, and only five percent of them were registered Republicans, the same percentage that listed "other." Sixteen percent were Democrats, 37 percent were independents, and 37 percent were non-registered. Last year, none of the 72 members of the White House press corps it surveyed were Republicans, effectively showing an uptick of three members of the GOP in the poll. Since the election, the mainstream press has received significant criticism, both from within and outside its ranks, for being too insular and liberal as it covered the 2016 presidential campaign and failed to see Trump's victory over Hillary Clinton coming. The New York Times even posted a planning document about its desire for greater diversity in "outlook" in its newsroom. The White House press respondents in 2017 said that on a scale of 1 to 10, with 1 being not at all disconnected from the rest of America and 10 being completely disconnected, they were a 6. Forty-five percent said their coverage was biased against Trump, while two percent said they were biased in his favor, and 53 percent said they were not biased either way. Seventy-three percent said their news organization would attend Saturday's White House Correspondents' Dinner. Also, 63 percent of them said they had been lied to, constantly or occasionally, by members of the Trump administration, and 68 percent agreed with the statement that Trump is the most anti-press president in American history. This entry was posted in Politics and tagged Donald Trump, Media, Media Bias, White House. Bookmark the permalink.